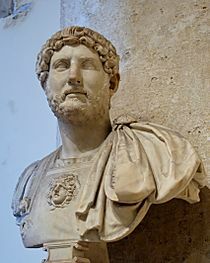 Hadrian (Publius Aelius Hadrianus, 24 January 76 – 10 July 138) was Roman Emperor from 117 to 138. He is best known for building Hadrian's Wall, which marked the northern limit of Roman territory in Britain. In Rome, he built the Pantheon and the Temple of Venus and Roma. In addition to being emperor, Hadrian was a humanist and a lover of Greek culture in all his tastes. Hadrian was the third of the so-called Five Good Emperors. Hadrian was born to a Hispano-Roman family, probably in Italica (near Seville). His predecessor Trajan was a maternal cousin of Hadrian's father. 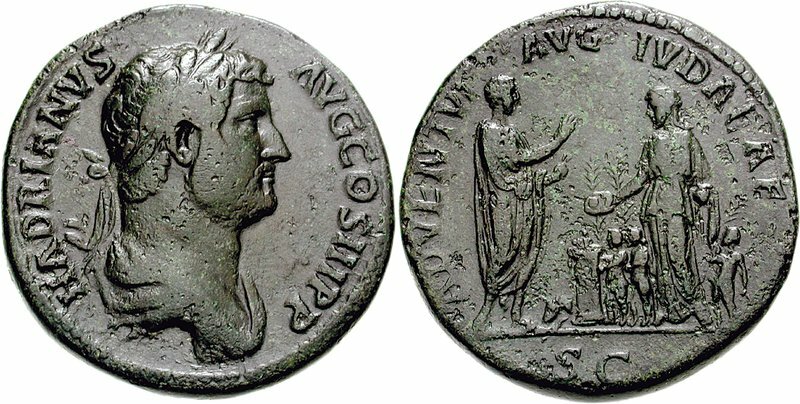 Trajan never officially designated an heir, but according to his wife Pompeia Plotina, Trajan named Hadrian emperor immediately before his death. Trajan's wife and his friend Licinius Sura were well-disposed towards Hadrian, and he may well have owed his succession to them. During his reign, Hadrian traveled to nearly every province of the empire. Hadrian sought to make Athens the cultural capital of the empire: he ordered the construction of many temples in the city. Hadrian spent much of his time with the military. He usually wore military attire, and dined and slept amongst the soldiers. He ordered military training and drilling to be more rigorous and even made use of false reports of attack to keep the army alert. Despite his fondness for the army, there was little military activity throughout the empire while Hadrian reigned. After he became emperor, Hadrian withdrew from Trajan's conquests in Mesopotamia and Armenia, and even considered abandoning Dacia. Late in his reign, he stopped the Bar Kokhba revolt in Judaea, renaming the province Syria Palaestina. In 136 an ailing Hadrian adopted Lucius Aelius as his heir, but he died suddenly two years later. In 138, Hadrian promised to adopt Antoninus Pius if he would in turn adopt Marcus Aurelius and Aelius' son Lucius Verus as his own eventual successors. Antoninus agreed, and soon afterward Hadrian died at his villa near Tibur. This famous statue of Hadrian in Greek dress was revealed in 2008 to have been forged in the Victorian era by cobbling together a head of Hadrian and an unknown body. For years, the statue had been used by historians as proof of Hadrian's love of Hellenic culture. Hadrian's Gate, in Antalya, southern Turkey was built to honour Hadrian who visited the city in 130. The Pantheon was rebuilt by Hadrian. Bronze head of Hadrian found in the River Thames in London. Now in the British Museum. Hadrian Facts for Kids. Kiddle Encyclopedia.